Chip giant Intel announced another attempt to enter the high-end phone market at the Mobility World Congress in Barcelona today. Although Intel did not mention the iPhone, the move will see Intel team up with consumer electronics giant LG to produce sleek devices that target the same high-end sector of the smart phone market. 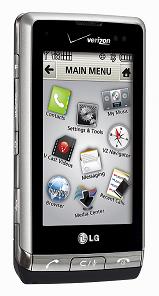 The LG Dare is one of its current smart phone devices. The new LG devices will use a forthcoming version of Intel’s mobile “system on a chip” processor, codenamed Moorestown, which Intel says will reduce power consumption while the device is idle by a factor of 10 compared to the current Intel mobile chips. For software, the devices will run the open-source Moblin version of Linux. Moblin is designed for mobile phones and is sponsored by Intel. “We chose Intel’s next-generation Moorestown platform and Moblin-based OS to pursue the [mobile Internet devices] segment because of the high performance and Internet compatibility this brings to our service provider customers,” said Jung Jun Lee, executive vice president of LG Electronics and head of its Mobile Communications Business Division. It seems that for LG it’s all about collaboration. LG is working with Ericsson to bring 3G capability to the new devices, according to Intel. This article was published on Monday, February 16th, 2009 at 12:42 pm. You can follow any responses to this article through the RSS 2.0 feed. Responses are currently closed, but you can trackback from your own site.